Michel Picard, Bali. Cultural Tourism and Touristic Culture, 1996. This interaction between touristification and Indonesianization is legible in the discourse of Cultural Tourism. As we have seen, perhaps because it could not really be implemented, the slogan of Cultural Tourism gave way to a remarkable profusion of discourses and incited genuine fervor in Balinese public opinion. But it would be wrong to see this discursive frenzy as mere verbal gesticulation, as a confession of impotence on the part of the Balinese authorities. For to the extent that they comprise a doctrine, these discourses express the attempt of the Balinese to appropriate tourism after it had been imposed upon them by the Indonesian government. Culture as heritage and culture as capital. In less than a decade, the doctrine of Cultural Tourism has come to blend the “fostering of culture” with the “development of tourism”, to the extent of entrusting the fate of Balinese culture to the care of the tourism industry. To come to such a point, the conflict of interests between culture and tourism had to be defused beforehand, since it is this conflict that had governed the elaboration of the doctrine of Cultural Tourism in the first place. A structural analysis of what I have chosen to call the “discourse of Cultural Tourism” — that is, the discourses emitted by the Balinese authorities that engage a representation of the relation between the signifiers “tourism” and “culture” — allows us to understand how this conflict is resolved in the discourse itself. The initial antagonism between culture and tourism is expressed by a system of opposites contrasting the respective attributes of each of these terms along two principal axes: “inside” / “outside” and “cultural values” / “economic values”. The solution of Cultural Tourism will be to deny the reality of this fundamental opposition, and it will do so in such a way that culture and tourism will exchange their respective attributes. This will make it possible to move between the two terms. This movement takes place by reconciling simultaneously tourism to culture and culture to tourism. On the one hand, the very fact of qualifying tourism as “cultural” bestows it with the attributes of culture, thereby exorcising the threat of destruction that it carries and legitimizing its penetration of Bali. But this is not enough: while it is stressed that tourism must become “cultural” in order to be acceptable to the Balinese, it is just as necessary that their culture be marketable as a tourist product. This implies that culture must bear the attributes of tourism. In other words, it is not enough that tourism becomes “cultural”; Balinese culture must become to some extent “touristic”. This is expressed in the discourse of the Balinese by a splitting of their conception of their culture, according to whether or not it is conceived in relation to tourism: whereas before the coming of the tourists their culture was, for the Balinese, a “heritage” (warisan) that must be safeguarded, it has since then also become a “capital” (modal) that they should profit from. In the discourse of Cultural Tourism, “Balinese culture” (kebudayaan Bali) is invariably defined in reference to three concomitant elements, which are like superimposed strata: its source is in the Hindu religion (bersumber pada agama Hindu); it inspires the customs (mengilhami adat istiadat) of the Balinese community and animates its customary institutions (menjiwai lembaga adat); it incarnates artistic forms of high value (menjelma didalam bentuk seni yang bernilai tinggi). And when it comes to specifying how these components of Balinese culture are inter-connected, it is the metaphor of a tree that seems to present itself most naturally — a tree whose roots are the religious foundation, the trunk the customary order, and the fruits artistic expressions. Thus defined by the network of relations woven between “religion” (agama), “custom” (adat) and “art” (seni), culture is presented as the “distinctive marker” (ciri khas) of “Balinese identity” (identitas Bali), expected to protect Bali against the risks of penetration and pollution propagated by foreign influences (kebudayaan yang dengan kuat mengaitkan agama, adat, dan seni sehingga sukar sekali dapat ditembus atau dicemarkan oleh pengaruh budaya dari luar). In this sense, their culture constitutes for the Balinese a heritage bequeathed by their ancestors (warisan yang kita mendapat dari leluhur kita) and that therefore must be considered a value to defend, nurture and promote (nilai yang harus ditahankan, dipelihara, dibina). Moreover, because of the intrinsically religious character of their “cultural heritage” (warisan kebudayaan), it is difficult for the Balinese to distinguish within it that which belongs to religion and that which pertains to custom, and therefore to trace a boundary between the sacred and the profane (sulit untuk memberi batasan yang tepat tentang mana yang sakral dan mana yang provan). Since the introduction of tourism, Balinese culture is no longer the exclusive property of the Balinese alone — for it is precisely this characteristic fusion between religious celebrations, customary practices and artistic creativity that forms Bali’s “image” (citra) as a “Tourist Destination” (Daerah Tujuan Wisata Bali) and that gives it a decisive pre-eminence over other destinations with which it competes. The result is that thanks to the appreciation that Balinese culture has managed to inspire in the tourists, it has become for the Balinese a “capital” (modal) — indeed their one and only capital — and as such, it must be considered as a value to exploit, commercialize and promote on the international tourist market (nilai yang harus dimanfaatkan, dipasarkan, dipromosikan di pasaran pariwisata internasional). That being the case, the Balinese authorities miss no opportunity to remind the population that if they want to be able to sell the artistic fruits of the Balinese culture, they must not cut down the trunk but, to the contrary, make sure that it is always well irrigated and deeply rooted. But they recognize that the task is very delicate, in that from the moment it becomes a “touristic capital” (modal pariwisata), Balinese culture is so intimately mixed with tourism that it is difficult to separate the cultural from the touristic (demikian eratnya kedua unsur pariwisata dan kebudayaan sehingga sangat sukar untuk dipisahkan). At the outcome of this double process in which tourism and culture exchanged their respective attributes — the inside opening onto the outside as cultural values acquire economic value —, the initial opposition between tourism and culture is defused, authorizing at the same time their fusion in the formula of Cultural Tourism. But this is done at the risk of confusing that which belongs to culture and that which pertains to tourism, a confusion in which the Balinese authorities saw, not long ago, the symptoms of a “touristic culture”. In effect, from the moment that what the Balinese consider the “identity marker” (ciri khas) of their culture — that is, the integration between religion, custom and art — becomes the “brand image” (citra) of Bali’s tourist product, it becomes very difficult to keep tourism separate from culture. And that is what the observation of the touristic exploitation of Balinese dance has shown, for we have seen that the Balinese proved unable to maintain a boundary between the performances reserved for their own use and those intended for tourists. It is precisely this play permitted by the evolution from a heritage value to a capital value that authorizes the discourse of Cultural Tourism to justify the priority given to the development of tourism — for it is tourism now that is supposed to ensure the vitality of the culture on which its development depends. The fact remains that despite repeated declarations that cultural values will in no case be sacrificed to the interests of the tourism industry, it turns out that the reason why the Balinese authorities call on the population to safeguard their culture is that the economic value of Bali’s touristic capital depends on the cultural value of its cultural heritage — or in more trivial terms, to attract ever more tourists. The culture in question here is already no longer a cultural heritage but has become a touristic capital. What was a cultural value to be preserved has become an economic value to be exploited. But one must push the reflection further to ask whether the vision that the Balinese hold of their culture as heritage — presented as being its original state, anterior to the arrival of tourists — does not in reality presuppose its conversion into a tourist attraction. To the extent that it is possible to assess, one could say that it is only after they came to consider their culture as capital, as a source of fruitful financial transactions, that the Balinese began to regard it as a heritage to safeguard with care. In this sense, it is the conception of culture as capital that induces that of culture as heritage, as if the culture is justified in making money if this safeguards the culture. If this interpretation is correct, one may suspect that the indivisible and harmonious unity between agama, adat and seni by which the Balinese define their culture — rather than expressing the primeval essence of their identity, as they claim — is the product of the semantic borrowings and conceptual recasting that the Balinese intellectuals were forced to carry out in response to the colonization, Indonesianization and touristification of their island. Rather than being a heritage bequeathed by the ancestors, tradition is invented for the needs of the present situation (Handler & Linnekin 1984). Nonetheless, it would be wrong to see in this splitting of Balinese culture between a heritage and a capital only a rhetorical device. Such a distinction between the origin of a patrimony and its exploitation expresses in reality the literally untenable situation in which international tourism puts the cultures of the world. At the very moment that the Balinese are called upon to exhibit their cultural identity — their uniqueness as it was shaped by their singular history — the manifestations of their culture that are promoted as tourist attractions become cut off from their origin to be turned into a product. Once written into a tourist brochure, once itemized, they become commensurable — that is, at once comparable and different — to the products that other tourist destinations put on the market to attract tourists. In these conditions, the declared intention of the Balinese to safeguard their cultural heritage should not be dismissed as merely a desire to draw profit from their touristic capital, which one could explain away as a fear of killing the goose that lays the golden eggs. Rather, it should be understood as an attempt to strengthen the filiation that ties them to their ancestors — in short, as an aspiration to rescue their culture from being turned into an item in a tourist brochure, one element in a series — and to restore it to its rightful place within a genealogy (Lanfant 1991; Bazin 1995). “As for converting the manifestations of the Balinese religion into tourist attractions, we must declare in our soul and conscience that we hardly appreciate our temples becoming places for the entertainment of tourists. Nonetheless, in the name of the devotion that we owe the government and by virtue of the tolerance of the Balinese community, we admit the necessity of it, and we support the action of the government with a view to developing tourism in Bali (Proyek Sasana Budaya Jakarta 1978: 159 [underlined in the text]). “Nobody on Bali would seriously think to challenge the idea of Balinese culture. Even those people who oppose tourism and see themselves as defenders of tradition are supporters of the idea” (Vickers 1989: 195). Where does the discourse of Cultural Tourism emanate from? While its spokesmen are indeed Balinese, their authority to speak is determined by their position in the ideological apparatus of the Indonesian state, as one may see in the use of the Indonesian language, which situates its speakers in a supra-Balinese context. In fact, the place from which this discourse is spoken is mobile, and that is what makes it so effective. On the one hand, the discourse held by the Balinese authorities purports to emanate from Bali and to speak on behalf of its inhabitants. As such, this discourse testifies to Bali’s position as dominated, whether it be in presenting tourism as a challenge coming from outside, in claiming for the province the judicial responsibility to conduct its own tourism policy, or further, in trying to make use of tourism to gain recognition of Balinese cultural identity on the national scene. And its spokesmen insist, consequently, on the need to encourage the initiatives of the local population and give them a voice. In this sense, the discourse of Cultural Tourism claims for the Balinese the status of subject. On the other hand, if this discourse is, in fact, a discourse of authority, it is precisely because its spokesmen are part of the apparatus of the Indonesian state, for which they diffuse the ideology of economic development and nation-building. In this regard, the appeal made to the Balinese to participate in tourism and develop their culture signals a penetration of the villages’ social space by the state. In this sense, the Balinese are the object of the discourse of Cultural Tourism — those of whom one speaks, but who speak not. The position of those addressed by the discourse of Cultural Tourism is hardly more fixed than that of its spokesmen — for in speaking in the name of the Balinese, this discourse is intended for the Indonesians and thus for Jakarta, while in speaking on behalf of the state and the general interest, it addresses the Balinese, in that they are part of the Indonesian nation — although one might ask whether the discourse of Cultural Tourism really addresses anyone at all, in that it does not seem to concern anyone in particular. It is almost as if it were speaking to itself, or rather, as if it were only a discourse for internal use, intended for its own spokesmen, whose personal identity tends to fade behind the anonymity of their function and their being part of a social group. This might explain why this discourse seems to hold its authority not from the truth of what it says or even from the eminence of those who propound it, but from the simple fact of its very enunciation. The fact remains that it is precisely the ambivalence of the location of both the spokesmen and the receptors of the discourse of Cultural Tourism — it is this play allowed by the movement of its spokesmen and receptors between a Balinese position and an Indonesian one — that makes its enunciation effective. The movement from one position of discourse to another may be charted in particular in the way its speakers manipulate the categories of “we” — the inclusive (kita) and exclusive (kami). 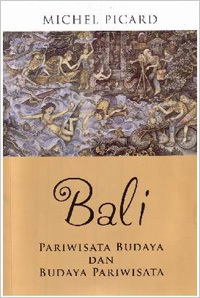 And, to follow the alternate play of their respective referents, one finds that the moment in the discourse when culture as the exclusive heritage of the Balinese becomes capital because of the tourists’ interest in it is also the moment when the “we” of the Balinese community must integrate itself in the “we” of the Indonesian nation. And so it is that in ratifying the conversion of the Balinese culture from heritage into capital, the doctrine of Cultural Tourism works not only to touristify Balinese culture but also to Indonesianize it. In this regard, the discourse of Cultural Tourism shows a propensity for syncretism characteristic of the Indonesian “mentality”, which tends to avoid conflict by seeking consensus. It is in this capacity that Cultural Tourism is presented by the Balinese authorities as a kebijaksanaan, a term commonly translated as “policy” but which must be understood as a position that is wise, well-informed, judicious and prudent, aiming to satisfy all the parties involved (Raillon 1984: 195). And it is precisely in its aptitude to reconcile contradictions that the formula of Cultural Tourism proves its “power” (kesaktian) and its quasi-sacred character. Thus one must consider the contradictions harbored by the discourse of Cultural Tourism not as an incoherence of logic, but as the proof of its capacity to conciliate contradictory positions, which allows it to offer to those who proclaim it the possibility of alternative interpretations that, while they may be logically incompatible, still profess the same doctrine. In these conditions, the ambivalence may be deciphered as an attempt to overcome in discourse the conflicts arising in society — not only among the Balinese but also between the Balinese and other Indonesians. This accounts for the imperative character of the discourse of Cultural Tourism, whose incantatory pronouncements multiply and which functions as a truly magical formula, a holy mantra, promising that social reality will be determined by its inscription into the discourse and will thus coincide with what one says about it. Indeed, as long as the problem that Cultural Tourism is expected to resolve is formulated in terms of a dilemma, it cannot be resolved: strictly speaking, there is no resolution to a dilemma, since each of its terms leads to the same result which appears to be at once undesirable and inevitable. Choice being impossible, the perception of the problem as a dilemma leads to a search for a subterfuge — such as, for example, naming the situation in the hope of controlling it symbolically. If this interpretation is correct, the discourse of Cultural Tourism puts a Balinese label on a tourism policy imposed from outside the island. In proclaiming it, the Balinese authorities try to make their own that which they cannot dispel, after having magically exorcised its subversive implications. Brand image and identity marker. With the acceleration of the touristification of Bali in recent years, the consensus assured until now by the formula of Cultural Tourism is disintegrating. While the rise of tourism and its related activities is undeniable, so also, unfortunately, are the problems engendered by its wild growth. Escaping all control, tourism today appears to the Balinese in the sly and fatal guise of AIDS, whose victims are starting to multiply on the island, and which is denounced as a poisoned apple brought by the visitors. And whereas formerly the Balinese perceived tourism as a bounded phenomenon, associated with the outside, now they see it as all-pervasive. For anyone observing the evolution of the situation over the years, it is hard to banish the impression that the barriers meant to contain the surge of tourism and to control its development are about to crash. Regularly predicted by the prophets of doom since the 1920s, and always held at bay, the fall of the Balinese from the Garden of Eden looks more imminent than ever. Bali: what they are saying. Faced with these dangers, the Balinese authorities seem to be increasingly divided in their appraisal of the situation and the measures to be taken. And above all, since the appointment of a new Governor in 1988, one now sees the crystallizing of a public opinion that dares to confront the government. The criticism expressed concerns mainly the ruin of the environment and the impotence of the provincial administration to control the runaway growth of tourism and to take action against the flagrant violation of regulations governing its development. Although the Balinese hardly speak of “cultural pollution” anymore, they are more and more openly anxious about the havoc wrought on the landscape and apprehensive about outsiders usurping their island — perhaps not so much foreign and domestic tourists as Javanese migrant workers and Jakarta-based conglomerates. Mercantilism is rampant; land speculation has reached dizzying proportions; and crime is growing — organized rackets and recurring waves of temple thefts are plaguing the island. The environment is becoming inexorably degraded as the rice fields and beaches are covered with concrete and the anarchic proliferation of hotels and souvenir shops ravages the beauty of the landscape for which Bali was once famous. Ecologists do their best to render the Balinese “conscious of the environment” (sadar lingkungan, abridged as darling), while they alert the authorities to the erosion of the coasts and warn them that soon there will be a shortage of drinking water. Meanwhile the rivers and beaches and the air itself are becoming more polluted every week, and the trash collection services no longer know what to do with the garbage piling up in dumps that were already saturated long ago. And this is not to mention the deterioration of infrastructures, groaning under the weight of a demand that seems to grow heavier by the hour. Even the tourism industry is beginning to admit that if something is not done soon, the degradation of the environment could condemn the future of tourism in Bali. In short, due to the lack of control and planning, it seems that the development of tourism can only end in the destruction of Bali. The “Garden Island” (Pulau Taman) is becoming the “Island of Concrete” (Pulau Beton). At the same time that these ills are being regularly denounced, tourism is becoming the issue of openly displayed political struggles. The splits follow a double line of fracture: a muffled opposition to the government on the one hand, and on the other, a divergence of views between Bali and Jakarta. Prominent Balinese periodically call for legal authority, for lack of which the provincial government is ever unable to control tourism and develop it in the interests of the population. They denounce the directives from Jakarta which too often override provincial regulations, while recognizing that it is very difficult for local officials to stand up to this type of pressure. Their concerns are echoed by the regional press which — along with the Jakarta papers — do not hesitate to publish articles accusing Indonesian and foreign capital of having made a clean sweep of Bali’s real estate at the expense of the Balinese, who find themselves progressively becoming foreigners in their own land (some say that nine-tenths of the coast is owned by non-Balinese). Aware of the gravity of the situation, the Governor has alerted the population against the risk of dispossession, recommending that they lease their land rather than sell it to investors from Jakarta. “Believe me, Bali will not change. Bali will always be Bali. In the past, a hundred years ago, today, and even a hundred years from now. Bali has never sold itself to tourism. The Balinese people are determined that it is tourism that must submit to Bali. Tourism is for Bali, not Bali for tourism” (Pangdjaja 1991b: 11). Although one should not be taken in by the inevitable rhetoric of such declarations when it is known that many highly placed individuals are filling their pockets as quickly as possible, it remains that the Balinese — even those with the bulging pockets — are truly worried about the future of tourism on the island. The fact is that there is a growing gap between what the tourists are supposedly seeking in Bali — unspoiled landscapes and an authentic culture — and that which they actually find. Hence the insistent rumor that Bali is becoming too touristic. In an attempt to restore an already tattered authenticity, influential spokesmen for Balinese tourism have come to propose that certain villages considered to be especially picturesque should be conserved in their traditional state for the tourists. This idea received a resounding confirmation at the International Conference on Cultural Tourism held in 1992 in Yogyakarta (Java), under the joint auspices of the Department of Tourism, Post and Telecommunications and the Department of Education and Culture, with the support of UNESCO, the World Tourism Organization, the UNDP and PATA (Nuryanti 1993). In the paper that he presented at this conference — whose theme was “Universal Tourism: Enriching or Degrading Culture?” — the Governor of Bali advanced the concept of “village tourism” (pariwisata pedesaan), publicly announcing the decision to make the three villages of Panglipuran (Bangli), Sebatu (Gianyar) and Jatiluwih (Tabanan) “tourist villages” (desa wisata) (Oka 1993). It seems for the moment that the implications of this concept remain rather vague and that its implementation raises unforeseen difficulties. But whatever the future has in store for this formula, the fact remains that tourism is now presented as the last hope — the only hope, in fact — for safeguarding the cultural traditions sorely tried by the present evolution of Balinese society, assailed as it is by a multitude of interconnecting influences — cultural and economic globalization, national development, the media, technology, etc.Thus one sees yet another reversal in the relationship between tourism and culture. Formerly, the Balinese culture was perceived as a living tradition that ran the risk of being corrupted by tourist commercialization. Now, however, tourism is not only absolved of the sins it was so recently accused of, but it is actually called on to “revitalize” a traditional culture threatened by the homogenizing perils of modernity. The Balinese authorities’ change of attitude toward sacred dances is significant in this regard: where not long ago, the concern was preventing their profanation by restricting their performance to ritual use only, now it is a matter of saving them from obsolescence by tapping them to inspire new dances that can in turn regenerate tourist performances that have grown dull from years of routine. Until recently, Bali’s image had been based on the attractions that originally made the island’s reputation well before they were elevated to the rank of “tourist objects”. But since the 1980s, there has been a shift of focus from culture to landscape and into the resort, with its tourist amenities. And now, to revive Bali’s power of attraction, fading with excessive exploitation, the idea has dawned of making new “tourist objects” to broaden the market appeal of Bali’s tourist product. It was with this in view that in 1993, the project of “Garuda Wisnu Kencana” was presented, better known in Bali as “GWK”. “The eruption of Gunung Agung in 1963 has resulted in thousand [sic] of victims. This calamity is recorded in the history of Bali island and becomes a legend eversince [sic]. Natural phenomenon initiated the eruption. The earth shaking the flowing of the lava and the panicking people have shown how severe the eruption is. History cannot certainly be repeated. However the picture which can vividly depict the incident is now able to be visualized by the aids of sophisticated technology. It will be performed in a very impressive and tense attraction as if the visitors are really experiencing when nature shows its anger” (GWK 1994: 2). Other attractions include: “From the Historic Time to the Present”, presenting scenes from Balinese history in diorama in the pedestal building; “Puri Bali”, a re-creation of a Balinese palace, where “art performances” will be staged in a manner reminiscent of olden times, and spectators will be required to get dressed up as Balinese aristocrats; and the “Calonarang Theater”, described as presenting this “Balinese folk tale in a mixed media setting” and which will give visitors a chance to see leyak — the fiendish minions of Rangda, able to assume fantastic forms in order to carry out their evil deeds, and still feared by all but the most world-weary Balinese. As if this were not magical enough, the “Gapura Seribu Amphitheatre” — which proposes “a comfortable ambiance for over 4000 viewers watching the collosal [sic] show executed by 1000 (seribu) performers” — will be equipped with “the most sophisticated technology”, which perhaps explains how, as the text immediately promises, “the time starts at dawn when the sun sets” (4). The initiative for this grandiose project, which dates from 1990, seems to arise jointly from the then Director General of Tourism and the Governor of Bali, who agreed on the idea of building a landmark visible from the airport to greet visitors upon their arrival in Bali. Taking into account Bali’s being the “gateway” (pintu gerbang) to Indonesia, this landmark should become, in the words of the Minister of Tourism, “the image of Indonesian tourism” (citra kepariwisataan Indonesia) (Suara Pembaruan 4/9/1993). In this regard, it is significant that the same newspaper article reporting the Minister’s words, also quotes the Balinese artist responsible for the project, who declares that the statue will represent “the image of Balinese culture” (citra budaya Bali). “Considerations of profit again take precedence over spiritual affairs as Bali becomes a Hindu Theme Park where everything is made quaint and neatly packaged for sale for the sake of foreign eyes” (IRIP News Service 1993: 25). It is on this point that the divergence of opinion is most significant (Warren 1995). The opponents of the GWK seem convinced that the traditional Balinese life, rural and harmonious, which so seduced the visitors of the era of the Netherlands Indies, is still viable and visible, if one will only take the trouble to ensure its preservation and accessibility with the appropriate measures. It is, by the way, on this same idealization of tradition that the Governor’s idea of “tourist villages” is based. Conversely, the fictive reconstitution of a décor illustrating scenes from traditional Balinese life by the aid of sophisticated technology implies a rupture with the world it recreates — as if, in short, the leyak were nothing more to the Balinese than a belief from the past. The passions inflamed by the GWK had only begun to cool when the Bali Post published an alarmist article informing its readers of the construction of a vast tourist complex, the “Bali Nirwana Resort” (BNR), on the site of the famous temple of Tanah Lot, included by the Governor in the 15 “tourist zones” decreed in 1988. The project, which covers 121 hectares, includes a 292-room luxury hotel, a 152-villa residential park, a 330-unit condominium complex, and an 18-hole golf course. It is being developed by the Bakrie Group, based in Jakarta, and is calling for foreign capital to finance 80% of the $324 million it is estimated to cost. But this is only the first stage of a new seaside resort that will eventually cover some 600 hectares, considerably bigger than Nusa Dua. Since the announcement of this project in late 1993, Bali has been shaken by a wave of protest of unprecedented force — student demonstrations, petitions by intellectuals, parliamentary debates, seminars, delegations to the Governor, editorials and letters to the Editor of the Bali Post, and so forth. It is important to point out that this is the first time that the development of tourism on the island has incited such a massive and unanimous opposition of Balinese public opinion. In fact, not since the massacres of 1965-66 preceding the birth of the New Order have so many Balinese dared to so openly confront the government. Although the opponents of the project denounce the forced conversion of fertile rice fields into a playground for the idle rich, and a handful of villagers from the surrounding area have for some time refused to sell their land, it is not land but religion that has rapidly emerged as the issue at the heart of the controversy. With remarkable unanimity, the opponents of the BNR insist that Tanah Lot is a symbol of Bali throughout the world and that the Balinese see it as the symbol of their identity. It is under this banner that they reject the BNR, protesting that the temple will be desecrated by the resort and accusing the government of trampling their faith for the sake of tourism. The fact is that religion has proved to be the most effective (and the most emotionally charged) means of mobilizing public opinion against the project. Student groups and Hindu intellectuals across the country showed immediate support, and the most radical have urged Parisada Hindu Dharma Indonesia to take up the defense of their religion, not hesitating to accuse this august institution of being no more than a rubber stamp for government decisions. In January 1994, Parisada finally decreed that no building could be built within a two kilometer radius of the Tanah Lot temple. This decree was approved by the President of the Republic and, had it been applied, it would have wiped the BNR off the map, since the hotel was situated less than 500 meters from the temple. But, as is often the case in Indonesia, it was more a maneuver to save face than a measure likely to be implemented. Rather than risk an outright confrontation, Parisada agreed to a compromise. The promoters undertook to modify their publicity campaign — which made free use of the image of Tanah Lot, famous among tourists for its picturesque silhouette against spectacular sunsets — in order to appease the critics accusing them of exploiting the Balinese religion for commercial ends. Some other concessions were made: the hotel site was moved somewhat inland and the construction of other buildings was postponed; other tourist installations very close to the temple, however, seem not to have been called into question. Meanwhile, the army put down the student demonstrations, and articles about the BNR disappeared from the front pages of the Bali Post. In May 1994, the government confirmed its approval of the project and work is proceeding, but as this book goes to print the situation is still unclear. As to its immediate effect, the BNR affair shows that the mobilization of Balinese public opinion did not weigh very heavily compared to the importance of economic interests and pressures from Jakarta. But this affair has brought to light the state of exasperation in which a growing portion of Balinese find themselves, most especially the influential faction of opinion — students and intellectuals — who no longer intend to let themselves be subjected to whatever the government dictates in the name of “development” and the “national interest”. The vehemence of the reactions published by the Bali Post testifies to this: their authors complain of being “cheated” (kecolongan), and fear that they will become foreigners on their own territory, that their island will be sold to the highest bidder. After Tanah Lot it will be the temple of Sakenan on Serangan Island to serve as the décor for frolicking tourists. And who knows, say the critics, if foreign investors will not soon be sniffing around the mother-temple of Besakih. Facing the threat of dispossession, the Balinese close ranks behind their religion, held aloft as the inalienable emblem of their identity. The situation seems to be precarious: how long can the Balinese population tolerate the proliferation of tourist facilities and the omnipresence of tourists before irritation and frustration turns openly hostile?. Are the Balinese losing their Balinese-ness? “Little by little, the Balinese cultural elements are being diluted and carried off into the ocean of world culture by the wave of tourism” (Sujana 1988). This cry of alarm did not pass unnoticed on the island, and the next day, the Bali Post devoted its editorial to the question of the cultural identity of the Balinese. In the days and weeks that followed, the newspaper published the reactions of its readers — distressed or incensed — as well as interviews with various prominent Balinese, for the most part academics and high officials. The counter-attack followed an evolution of issues that reveal much about the challenge of tourism in Bali, in that it recapitulated in an accelerated fashion the transformation of Cultural Tourism into touristic culture. The editorial began by reminding the Balinese that they must consider themselves above all Indonesians, and that from the moment the central government decided to make their island the touristic show-window of Indonesia, it was inevitable that their traditional world would suffer upheaval, some of which would be painful. It was up to them, therefore, to show themselves as equal to the test and to rise to the challenge of tourism. Then the first articles began to question the foundations of the argument of the Balinese sociologist, insisting: “It Is Not True that the Balinese-ness of the Balinese Is Weakening” (Tidak Benar Kebalian Orang Bali Memudar). This is because the cultural identity of the Balinese must be seen in a double dimension: a superficial structure (luar) and an inner structure (dalam). The inner structure — the religious foundations of Balinese society (agama) and the values of communal solidarity supporting the customary institutions (adat) — is not threatened. Only the superficial structure — and in fact it is proof of the cultural dynamism of the Balinese that they have been able to utilize the wealth of their culture’s artistic fruits (seni) to develop tourism — is wedded to the exigencies of the times and adjusts itself to the transformations of the environment. After a period of lively debate, the figures interviewed affirmed that, in fact, “The Balinese-ness of the Balinese Is Stronger Than Ever” (Makin Bertambah Kebalian Orang Bali) — for the Balinese culture is justly reputed for its dynamic resilience, for the propensity of the Balinese to adopt only what is appropriate from foreign influences and, above all, to transform and incorporate them according to the dictates of their own genius. In these conditions, the very interest of the tourists in their culture is a heady stimulant, in that it is a matter of both pride and profit for the Balinese. Nothing surprising about this, so far. But what seems significant to me — and this is my point — is that one of the principal arguments put forward to refute the doomsday view of Bali’s imminent ruin by tourism was, remarkably, this: that the best proof of the cultural authenticity of the Balinese is the fact that there are ever more tourists coming to the island. And this, they point out with some pride, would certainly not be the case if the Balinese culture were no longer what it is reputed to be. A survey among the newspaper’s readers was taken on this occasion, showing that while 40% of the persons interviewed attributed to the influence of tourists an erosion of Balinese-ness, 60% thought that, to the contrary, the increasing number of tourist arrivals in Bali was the best proof of the force of attraction of the Balinese cultural identity (Widminarko 1989). Thus, called upon to conform to their image, the Balinese not only are required to be Balinese, but they must be worthy representatives of “Balinese-ness”; they must become signs of themselves. And all their attempts at the affirmation of their identity are but a reaction to this injunction from which they are unable to extricate themselves. They appropriate the touristic vision of their culture while at the same time they try to prise themselves free of its grip. Such is the identity crisis to which the Balinese are submitted — a crisis that shows itself in a paradoxical injunction. If this analysis is pertinent, one could say that what the Balinese authorities celebrate today — but for how much longer? — as a “cultural renaissance” is nothing other than the logical conclusion of what they not long ago denounced under the name of “touristic culture”. In becoming Bali’s brand image — that which marks the uniqueness of its tourist product, that by which the island of Bali tries to distinguish itself on a highly competitive international market — culture has become, indissociably, the identity marker for the Balinese, that which characterizes them as a particular society, that by which they define and recognize themselves. The “Balinese culture” in this double sense is the interface between the inside and the outside, and at the same time, it is the ground where the Balinese and outsiders may come together. It seems to me that one can speak of a touristic culture at that point when the Balinese come to confuse these two uses of their culture, when that by which the tourists identify them becomes that by which they identify themselves — or, more precisely, when the imperatives of the touristic promotion of their culture have so far infiltrated the considerations that motivate their will to preserve it that the Balinese end up taking the brand image of their tourist product for the identity marker of their cultural productions. Thus it is that the Balinese, enjoined to preserve and promote their cultural identity in reference to the outside world’s view of them, have come to search for confirmation of their “Balinese-ness” in the mirror held to them by the tourists. The photograph of Rangda and the tourist couple already mentioned is a patent example of this. It is taken from a publicity campaign launched toward the end of the 1970s by an international hotel chain. Each hotel of this company in Southeast Asia is represented by an emblematic image of the tourist destination where it is implanted. While the “festivities” the tourists will find in Bali are magical and mysterious, in Singapore and Hong Kong the connotation is rather commercial, while in Bangkok and Manila it is frankly sexual. This is further accentuated by the reification entailed by the vocabulary used in Indonesia to designate sites and other tourist attractions. As Kathleen Adams points out in regard to tourism in Tana Toraja, the fact of designating a village as a “tourist object” (obyek wisata) can only reinforce the tendency of the officials of the Directorate General of Tourism to consider its inhabitants as passive objects, as merchandise to promote on the tourist market (Adams 1990: 33). About 1,000 hectares of irrigated rice fields disappear every year; the total surface of irrigated rice fields in Bali is around 90,000. The opposition between these two images is unfortunately not as marked as it would seem, as may be seen in the recent vogue of tamanisasi, instituted to restore to Bali its intrinsic qualities of “B.A.L.I.” (Bersih: “clean”; Aman: “secure”; Lestari: “preserved”; Indah: “beautiful”). Thus in 1993, with the aim of winning a prize for cleanliness awarded by the central government and at the same pleasing the tourists, the new Bupati of Gianyar issued the startling decree to cut down all the trees along the roadsides — including some trees that were hundreds of years old — and to plant artificial gardens (taman) which make copious use of painted concrete (beton) to the most hideous effect. The program of tamanisasi vaunted by the government turned into a “cementing over” (betonisasi) of the environment, to the great consternation of tourists and Balinese ecologists alike. One finds more and more frequently in the Indonesian press accusations of this sort: “Bali is like a damp towel that one wrings until it's dry. And when the towel is in tatters and won't hold any more water, there's nothing left to do but throw it away” (Suara Pembaruan 30/7/90). This regenerative role of tourism was strongly affirmed at the conference of Yogyakarta where the first theme, entitled “Revitalizing the Cultural Heritage” was presented as follows: “Tourism should be viewed as an asset or tool for the preservation of heritage... However, the concept of preservation should not be a “protectionist” one but rather it should be seen as an integrated concept for the revitalization and development of culture” (Nuryanti 1993: 2). Thus one of the principal figures of the Seminar on Sacred and Profane Dance of 1971 declared in 1985 that now it was not only bebali dances that were threatened by imminent disappearance but wali dances as well, since many of these were no longer executed in the context of the religious ceremonies for which they were created. Consequently, while admitting that wali dances should not be performed out of context, he proposed that they should be “exploited” (diolah) in such a way as to provide inspiration for the composition of new dances — which, he said, would facilitate a “mutation of sacred values into artistic values” (peralihan nilai sakral ke nilai artistik) (Pandji 1985: 480-481). Thus twenty new 18-hole golf courses have been approved for development, comprising a total investment of around $1.3 billion. These are in addition to the 3 existing golf courses on the island. Whatever its promoters, and detractors, might say, it is clear that the public for which the GWK is intended — like that of Taman Mini in Jakarta — is Indonesian, and particularly Balinese, rather than foreign. Opponents of the Bali Nirwana [“paradise”] Resort have dubbed it the Bali Neraka [“hell”] Resort. The exhibition of satirical drawings organized by the Galleria Bebek in Denpasar in December 1993, ironically titled Bali Sing Ken-Ken (“Bali No Problems”) testified eloquently to the rise of this state of mind among the Balinese. The validity of this conclusion is certainly not limited to Bali, as may be seen in a number of analyses tending to show that touristified peoples come to question their identity as tourists expect them to present an authentic image of themselves (Bruner 1991a; Errington & Gewertz 1989; MacCannell 1984; Simpson 1993; Volkman 1990). One should beware that this could have serious consequences for the future of tourism in Bali. Pico Iyer expresses the point well: “When we choose a place to visit, the way a country carries itself and markets itself — the way it knows itself, really — is everything. We flee certain resorts not just because they are touristed but more because they have begun to see themselves through tourists' eyes, to amend themselves to tourists' needs, to carry themselves in capital letters: because, in short, they have simplified themselves into their sense of what a foreigner wants” (Iyer 1993: 115-116).